Welcome, shelter and rescue staff and volunteers! Thanks for the lifesaving work you do, and thanks for your interest in our new booklet, Simple Behavior & Handling Tips for Shy or Fearful Dogs. 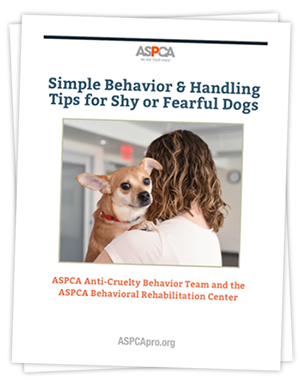 These four fast and easy tips require no extra expense or personnel, and are used by the ASPCA Anti-Cruelty Behavior Team and Behavioral Rehabilitation Center. We’re excited to share them with you! Drive-By Treats, Quick & Dirty Handling, Hand Targeting and Helper Dog Play Groups can all help you bring about tremendous change in dogs with particular fear issues.